The Circus Buffet located on the casino level at Circus Circus is open for breakfast, lunch and dinner. The atmosphere is welcoming with its bright and attractive décor. The buffet is known for its value and variety of offerings including a salad bar with the freshest fruits and vegetables, a variety of carving stations and a huge assortment of desserts. 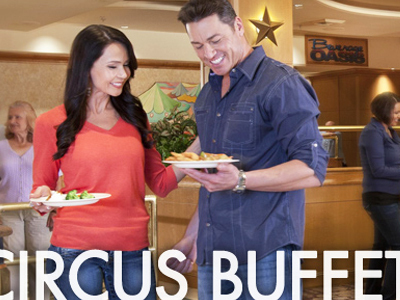 The Circus Buffet located on the casino level at Circus Circus is open for breakfast, lunch and dinner. The atmosphere is welcoming with its bright and attractive décor. The buffet is known for its value and large variety of offerings including a salad bar with the freshest fruits and vegetables, a variety of carving stations and a huge assortment of desserts. Known as one of the biggest buffets in Las Vegas, there is sure to be something for everyone at the Circus Buffet. Children under 4 eat free with a paying adult. With over 50 items from which to choose, you will be sure to find something to fill you up at this inexpensive buffet. The food was average, the layout made it difficult to access. I doubt I’ll ever go back. I went to this buffet on my first day of vacation. I drank some apple juice and then later that night threw up. It was a little expensive and not good quality. They served horrible pasta, Mac and cheese and even the meat was bad. The meat had so much fat and bone in and on it I hated it! This was probably our favorite buffet in Vegas.. It was delicious and we really loved it! But unfortunately the only really good meal was breakfast and that the fact they gave us free buffet tickets when we checked in.. I would only recommend the breakfast buffet. I came here with my husband and son and stopped in to see what kind of free shows we could see here. We were hungry for dinner so we stopped at the buffet. Not expensive, but the quality isnt much more than cafeteria food. The dining hall isnt very welcoming in decor, and pretty run down. The food certainly did not seem fresh nor healthy by any means. I would not go here again, there are too many other buffet options in Vegas to try this dud again.